My father got this lawn mower when he lived in Hemet, California. While we were there, we used it to cut the high grass in his yard. He would go out of state during the summers to avoid the desert heat. His automatic sprinklers remained on timers so the grass would not die. When he'd get home, the grass would be about three feet high. This Weed Eater lawn mower was able to cut through the grass and weeds without any problems. There was so much grass, we left the bag off and just raked it up. It was easier to push than other lawn mowers we used at his house. Now my father lives with us, we use his mover to mow the grass here. It is great to use around the bushes and trees. It does well around the sidewalks and other lawn borders. Our lawn is much larger here. We use the Weed Eater mower for the edges and the riding mower for the larger areas of grass. It has been reliable for us. We only had problems with the mower starting soon after my father bought it. After using it two times, we could not get it to start. We thought of taking it back, but my husband wanted to look at it since it had worked beautifully the time before. He was able to tighten down the carburetor and that seemed to do the trick. We have not had any problems since. 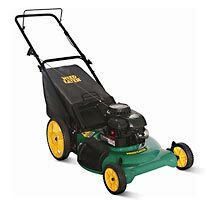 We would recommend this mower to friends and family.